Best hi-fi and AV racks 2018 | What Hi-Fi? The ideal environment for your hi-fi and home cinema kit is level, dust-free and secure. These racks tick most of those boxes and a few more besides - though the dusting is your job. So don't go to Ikea, don't even think about stacking stuff on the floor - get one of these instead. Trust us, your system (and your ears) will thank you. Chunky but elegant looks and, even more importantly, the ability to let your equipment do its thing unhindered. Modular design makes for ultimate flexibility. This builds on the Eco 60-40's design and dampening, making it a great choice at this price. The price we're quoting is per tier. 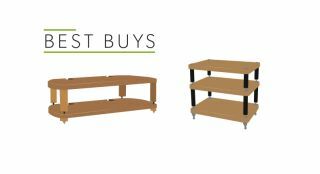 Another modular design, albeit an all-round pricier option: each extra shelf costs at least £250. But those looking to spend a little more won't be disappointed. This large rack can handle a 65in TV without any problems and no hi-fi separate should be too wide to accommodate. And it lets your electronics breathe freely.